The greatest benefit of using solar powered light towers is the reduction of conventional installation and operational costs. Traditional lights that are connected to the grid can be expensive to install in remote areas. One has to invest in trenching services for ground support, electrical wirings and maintenance services. Solar light towers can reduce this need because they are conveniently transportable and easy to setup, taking over half the time it takes to install permanent lighting fixtures. With the solar battery charged, the units can be used immediately after installation. Fuel powered light towers are an expensive investment due to ongoing costs associated with the machines. Operators are required to constantly feed the units with fuel, and in remote areas, this is a problem. Making numerous fuel trips throughout the day can be costly, especially for businesses that have multiple light towers running on the site. The trips are also time consuming; and if the isolated location is dangerously inaccessible, there could be a gap in usage when the fuel runs out. Solar powered towers completely remove the need to prioritize fuel trips. LEDs can be applied to solar powered towers for an energy efficient, hands-off approach to remote lighting. Due to the light’s low energy requirements, less power is needed to generate consistent lighting. This generally translates to less sunlight needed to keep the fixtures on and longer battery life for the light towers. LEDs offer a lifespan of up to 50,000+ hours (compared to 20,000+ hours for metal halide lamps). They can be turned on instantly without a delay in full light output. The fixture’s solid state design also allows it to withstand rough treatment and outdoor conditions, which is suitable for remote solar light tower installations. “Going green with solar power does not have to be done on such a grand scale in order to produce significant benefits. Modern solar technology coupled with the advancements in LED lighting technology have produced some extremely simple yet effective ways for almost any application to produce savings and convenience unheard of only fifteen years ago,” said Larson Electronics. Solar powered light towers thrive in isolated areas with demanding lighting requirements. In remote military bases, the units are used for parking lot lighting, pathway and trail lighting, perimeter security lighting and roadway lighting. The portable nature of the towers offer flexibility in hostile conditions. For example, individuals can relocate a solar powered light tower from one location to another without needing to worry about wirings and grid connections. In mining and construction industries, the units may be used to boost safety, security and guidance on the work site. Like military bases, mining facilities are typically located in far-flung locations. Solar powered towers are highly applicable in most aspects of mining operations. It can be used to illuminate dangerous, makeshift roadways for trucks entering and leaving the facility. Furthermore, the fixtures are suitable for perimeter lighting to enhance security and monitoring. 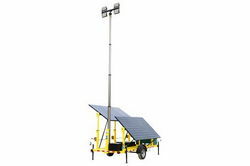 For emergency rescue services, organizations may use solar powered light towers when setting up a remote base in a disaster zone. With the possibility of damage to the area’s electrical grid and minimal access to fuel sources, relying on conventional lighting is not an option. Under such circumstances, solar light towers may be applied to ensure around-the-clock operation. Leaving the disaster zone is also effortless- workers would simply need to fold the towers into their portable state and transport them back to their original location. Lastly, in the agricultural sector, farmers may use the robust light towers during busy harvest or planting seasons. Because trenching around the farm-site, where the land is tilled for growing crops, is largely prohibited and may compromise the quality of the soil, portable lighting options must be taken into consideration. Fuel powered light sources are not suitable for remote agricultural locations, due to risk of fuel contamination through spillage. The emission of smoke and fumes from the towers are also undesirable for nearby crops and workers around the farm. Solar towers can be deployed in various sections of the location, including the barn, loading area, outer perimeters, crop growing sites and inaccessible pathways.